Bye Bye Beehive │ A Hairstyle Blog: Half Updo. 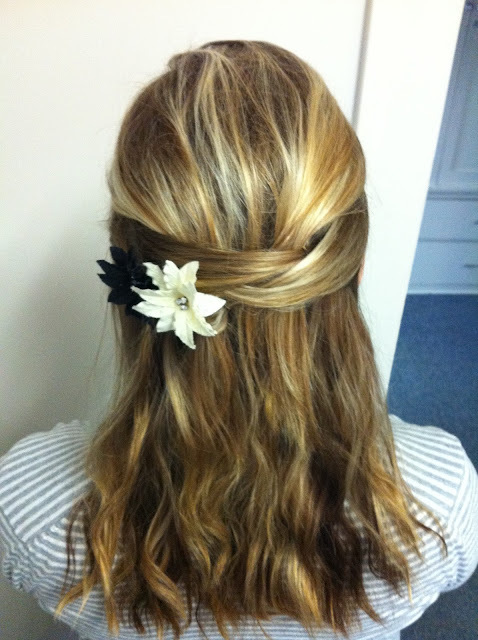 Just the other day, one of my best girlfriends, Alyssa, sent me a Pinterest pin and asked me to try this style. So I did what any decent friend would do and whipped it up the next day. Granted, mine looks NOTHING like the photo (because hers it totally teased and awesome). I'm fairly certain that mine turned out way different because there were no instructions to go along with it. So hey, I just went for it. Since the style didn't come with a how-to, how about I provide some sah-weet step-by-step action for you? You're welcome. I began with crimped hair that I had loosely braided the night before. I gathered the top section of my hair (still with a part) and secured it at the back of my head with a barette. In hindsight, I should have used bobby pins or a clear hair elastic. That would have been much easier to cover than my big old barette. Then, beginning with small sections below the top portion that was already baretted, I would take a section from each side of my head and pull it back to cover the barette and then pin it. I let the loose end hang down. In fact, they kind of add different dimensions and layers to my hair which is pretty cool. 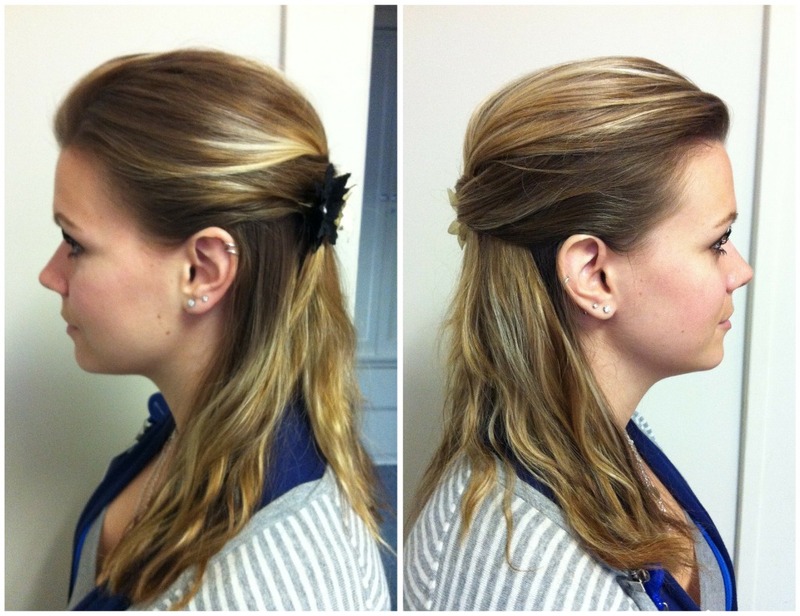 If your hair was curly, the loose ends could make a really cool layered look. I criss-crossed sections like that until I had half of my hair pinned up. I'm a little disappointed the criss-crossing didn't show up better. It just looks like 2 pieces that were crossed, when it was really 4 or 5. I'm going to follow my instructions a little better next time and maybe not try to hide the bobby pins so much. 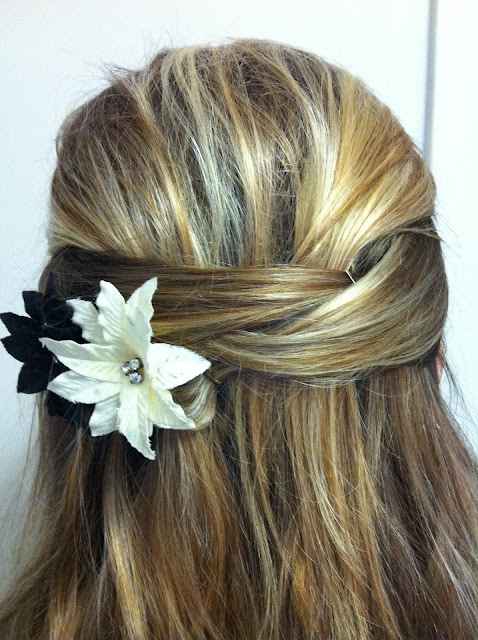 I added 2 flower pins to hide the last big bobby pin that just wouldn't disappear under the criss-crossed strands. And voila! 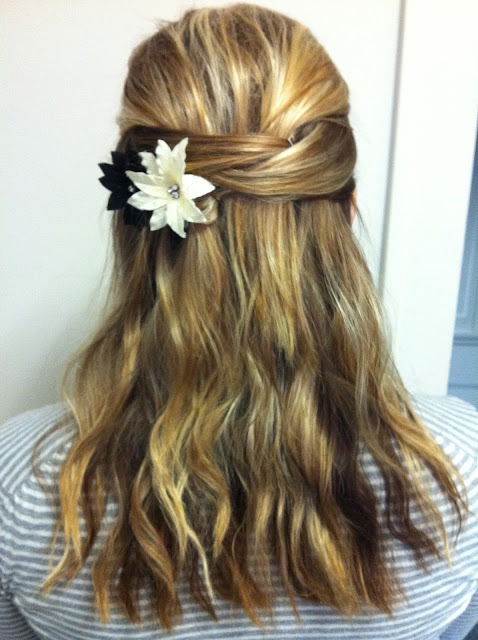 A hairdo that can be casual, formal, or as Alyssa is thinking "perfect for her wedding day hair!" Right-on girl. That makes me so happy. What do you think? After checkin' her blog, I discovered she's a professional hairstylist. Sheesh! No wonder hers looks so much better than mine! Don't judge, ya'll!!! So pretty and dainty looking ! I love this classy look very much ! beautiful! I think it turned out great! Ooooooo very pretty! I like the flowers too. This is so cute!! I might try it today. I think it looks like a going out hair do with that pretty clip in it. Thanks for sharing how to! This looks beautiful! I think the style is really awesome. It is pretty, smooth and touchable! Beach Twist in Winter? You Betcha!